This book dwells on the shelves of many museums’ souvenir shops. I often would pick it up and look through the pages, trying to recognise what I have seen, compare with my vision. When I eventually bought it – I was not disappointed. I picked this book because I knew the author would have to talk about Outer London – in the form of markets, including farmers’ markets and carboot sales. The book is organised by area (Central, North, West, Southwest, Southeast, East), within these sections markets are presented alphabetically, each with icons of the goods that can be found there, nearest transport, opening hours, and contact details to get a stall. After the technical details Andrew describes the market, usually taking from a half to two pages. Markets close to each other are combined (Camden Markets, Brick Lane markets). The front cover of the book unfolds to show the maps of the markets. The guide is very bright, on a thick paper that can sustain days in your backpack. Photos are very lively, and often give a very close idea to what a visitor can expect. Some pages contain ads for markets, but it looks natural and is located next to the articles that talk about the advertised markets anyway. The banners serve more of an emphasis to convince to come where the reader is already is thinking of going rather than an intrusive persuasion. At the end of the book, there are sections on Farmers’ Markets, Car boot markets, indexes of all markets by name and subject – and a perhaps the most useful: “week at a glance” which allows you to see which markets are open which day of the week. It will definitely come in handy if you wake up in the morning and want to go to a market but do not know which one. It was written in 2008, but is unrealistically future proof, even today its stance on many opaquer places is very relevant. Authors’ fifteen years of experience chronicling these markets is apparent. While they do shift in their presence, they rarely completely revamp, so a perceptive user may unveil the core values under the veil of day-to-day management. I have found an echo of my own ideas on Merton Abbey Mills and Walthamstow Market. Certainly over the past years, some places have shifted, facilities renovated, atmospheres diversified, gentrified. All of this would be a great addition for an updated edition along with new opening and contact information which could have changed. In a city like London it is hard to trust a guide written a decade ago. As a guide, it serves purely utilitarian needs. Its main aim is to inform, not to entertain. However, the language of the book is so very clear, that you can read it whole as a book and not just the descriptions of markets you are to visit: you will not get bored. What is more, you might just want to visit some by purely reading Andrew’s musings in order to compare your vision to his. This reflects a lot my own project – not purely to inform, but start a discussion about one place or other. Andrew manages not to be repetitive, even though markets are repetitive in their nature – they are just stalls on a square. The author manages to paint a very vivid picture, reflecting a distinctive nature of each. The evaluation is at the same time objective and has a hint of personal touch, – a refreshing style, compared to many other guides and the likes of Londonist and Time Out. My biggest disappointment came when I looked for Outer Boroughs. Unfortunately, not even all of the biggest ones have not made it into this book. Clearly, it was out of scope, but if Merton and Watham Forest is in, I cannot comprehend, why Redbridge or Enfield is out. This is just not serious. Walthamstow is mentioned, but Leytonstone isn’t. Ealing Farmers Market is in, but Southall Market is out. There is no Kingston, no Romford, no Dagenham Sunday Market, (though launched in 2002, five years after publication), no New Spitalfields (the reason might be that it is a mostly wholesale market). There aren’t that many markets in the rest of the Boroughs. Outer Boroughs are pariahs even in such a narrow research that could easily approach being exhaustive just by adding thirty odd pages. 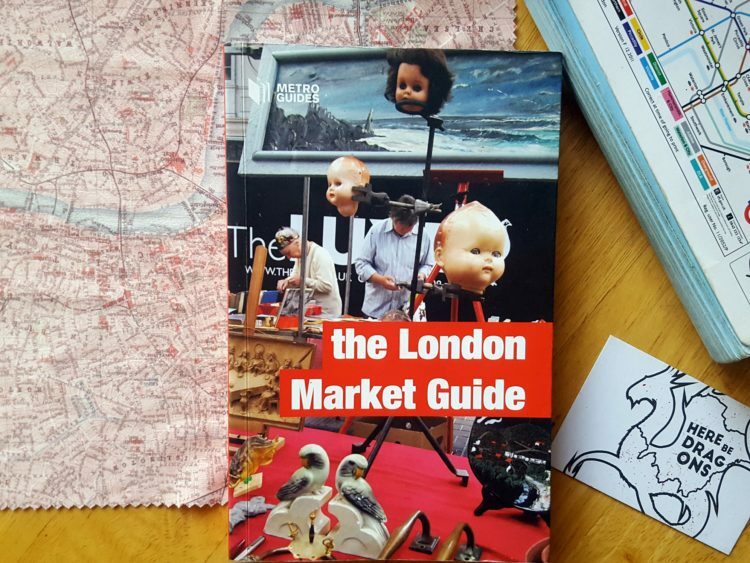 An interesting read and a useful tool for a casual market visitor and anyone seeking to explore the capital through the market lens. 7/10, a comprehensive guide for Central London, one star is taken off because it is over 10 years old, another one for the missing markets.